I decided that this and next week will be so busy that it give me the push I needed to go ahead and do my personal challenge yesterday. It’s a very simple one, for a reason. I was busy with canning, preserving, and gardening! I chose a small, simple goal to push me out of my comfort zone. I’m going to make a book with a different bookbinding technique every month until the end of the year. For August, the one I chose is so simple and quick that I’ll probably make several more. 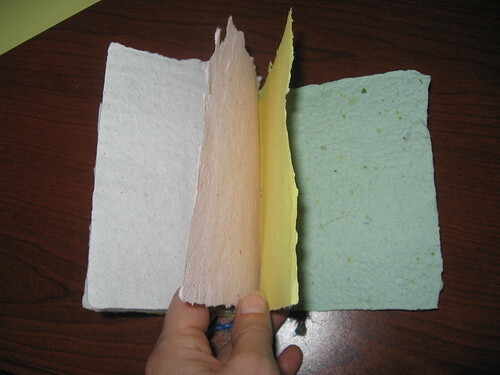 It is perfect for a sampler of the handmade recycled paper I’ve been making this summer. This is a simple three-hole pamphlet. The binding yarn was a wonderful plus, wrapping the little book packet that Aimee sent to me a few weeks back. I told her that I’d reuse it, and here it is. The blue jay feather is from the Back Forty. 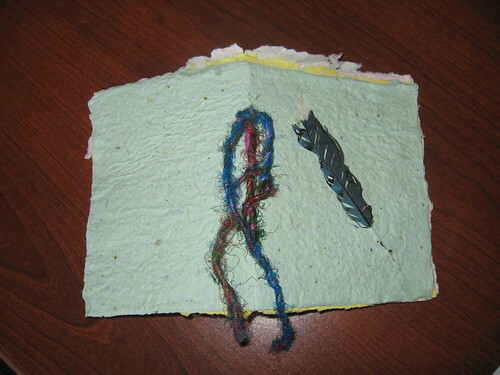 It is embedded on the top of the paper with a little pulp on the quill and the edges.